To celebrate the premiere of Schlotzsky’s new Big League Clubz Sandwiches, matrixx constructed an experiential in-store and online UGC social media marketing campaign built around the spirit of america’s favorite past-time, collecting baseball cards. 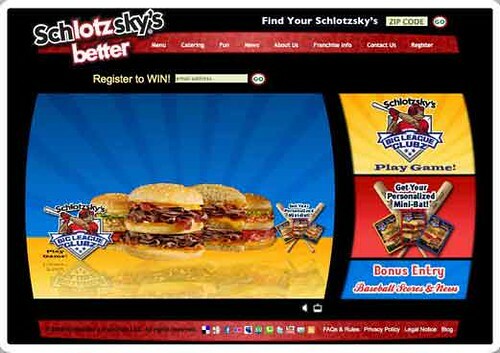 When customers bought a “Big League Clubz” sandwich at any Schlotzsky’s restaurant, they received a trading card promoting the sandwiches and highlighting the elements of the sweepstakes. Each of the three trading cards featured a different Big League Clubz sandwich. Fans who collected any three trading cards could upload a creative picture of themselves and trade these pictures to the www.BigLeagueClubz.com photo gallery to receive a free, personalized “Lotz Better” mini bat courtesy of Schlotzsky’s. As Senior Interactive Producer for matrixx I lead the creation of the campaign and budgeted, established the graphic user interface and managed a baseball themed sweepstakes with an all-inclusive trip to “See All th Stars” in St. Louis, Missouri at the same time the city hosts the 2009 all-star baseball game. In addition, I also lead the blog, blogger outreach and social network development and worked with a great team to develop the best offline marketing strategy and content. The online campaign microsite contained many user engaging elements which includes an online baseball advergame, a downloadable Yahoo! baseball scores desktop widget, a “Draft your Friends” Facebook Application and a photo UGC element using a Flickr API key. Additional experiential advertisements include text-in mobile subscriber lists and a campaign partnership with SimDynasty online simulation fantasy baseball. In addition I was also responsible for creating and analyzing the innovative campaign blogger outreach strategies. Within the first 30 days of the campaign, the microsite has received thousands registrations and millions of deep brand engagements. Months after the campaign has ended, we are still seeing thousands of game loads each day. My trip to Schlotzsky’s in Orange County, CA!